Wash quinoa in cold water. Drain and place in a pot with milk. Add cinnamon powder, stir well and let cook on low heat. Stir every few minutes and remove from heat when liquid has evaporated. 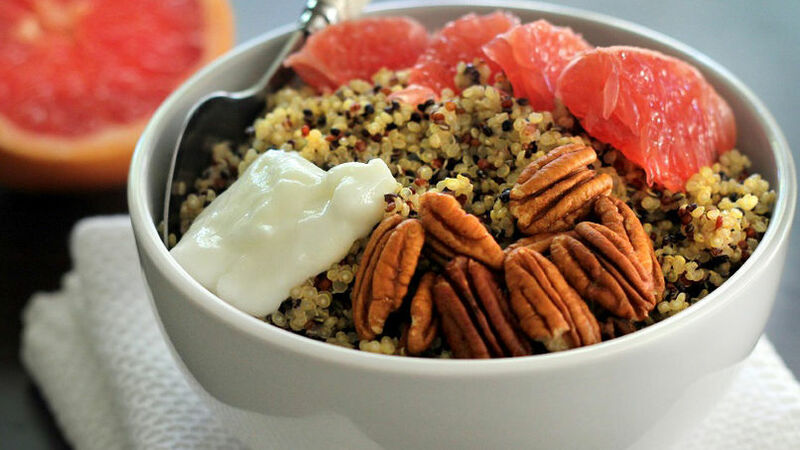 Serve quinoa in a bowl, add sliced grapefruit, walnuts and yogurt. If you prefer it to be sweeter, add a tablespoon of honey. It is possible to make a breakfast that’s both nutritious and satisfying. This recipe will prove it to you and you can change it up as you please. The original recipe uses quinoa as the base and refreshing grapefruit. You can add a little more fruit but don’t forget that nuts are also a great topping for this recipe. Vanilla yogurt adds the desired sweetness to this breakfast and if you wish, add a touch of honey. What other ingredient would you add?